Webbing or fusion of the skin between the toes is very common in M-CM, particularly between the second and third toes. This is called syndactyly. Syndactyly of the fingers is less common and when present, usually involves fusion between the third and fourth fingers. Also, M-CM can cause polydactyly that is usually postaxial. Polydactyly and syndactyly can occur unilaterally or bilaterally and, if severe, can easily be corrected and cause no additional health problems. Buying shoes can be very difficult for children with M-CM. 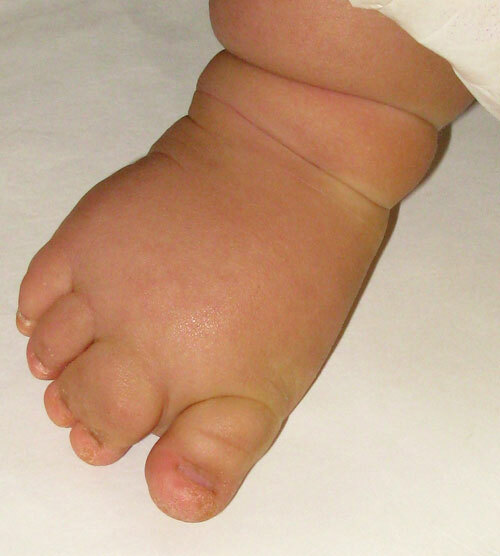 Many have broad, puffy feet that are often large and asymmetric. Some families have to purchase shoes of different sizes and sometimes custom shoes have to be made. Children with M-CM also often have very small, deep-set nails (particularly the toe nails), which are difficult to cut and care for. A podiatarist may be needed to assist in proper care and monitoring.